Doshin the Giant (aka Kyojin no Doshin (巨人のドシン) in Japan) is a 1999 Nintendo god simulation game for the Nintendo 64DD released in Japan on December 1, 1999. The original game was bundled with the 64DD console. An add-on was released five months later called Kyojin no Doshin Kaih. Sensen Chibikko Chikko Daish.gou, which took a very different perspective of the game. 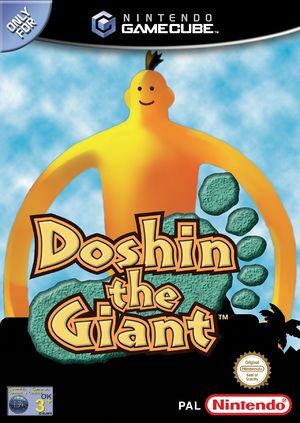 The original Doshin game was later released and upgraded graphically to the Nintendo GameCube and released in Japan on March 14, 2002 and Europe on September 20, 2002. It was not released in North America because of a deal struck between Nintendo and Atlus over the localization of another niche game called Cubivore: Survival of the Fittest, which would have released at about the same time on the GameCube. The graph below charts the compatibility with Doshin the Giant since Dolphin's 2.0 release, listing revisions only where a compatibility change occurred. This page was last edited on 18 March 2019, at 07:27.